Customers lie. That doesn’t necessarily mean they’re untrustworthy people or bad customers. It’s just that sometimes, despite their best intentions, they fabricate or play loose with the truth about what’s really going on. As a small-business owner, you need to be aware of the common lies customers will feed you and learn to ask the right questions to help you build a profitable company. 1. “I’m very interested in buying your product (or service).” When asked, most people will say they like what you have to offer and are very interested in buying it. Unfortunately, they don’t take this question very seriously and are just being polite. The question to ask to spot the lie: “What does the problem cost you that my product solves?” This will help them focus on what they see as the real return. 2. “I have the money to buy your product.” When asked, many customers will say they have the money to purchase what you’re selling. What you find out later is, they don’t have the money or the budget or they’re not the final decision maker. This can be very frustrating for any small-business owner. The question to ask to spot the lie: “Who has the money to actually buy this product in your organization?” or “What’s the maximum you can spend without talking to your boss (or your spouse)?” This answer can reveal additional decision makers. 3. “I think your price is too high.” It’s not. This statement usually means either they’re just trying to negotiate a better deal or you haven’t showed them enough value for your product. The question to ask to spot the lie: “What’s the monetary value to you if I solve your problem?” The answer directly relates to the price of your product. 4. “I need a big discount to buy your product.” This statement usually comes at the end of the negotiation to get a last-minute concession. This is a test to see again if they’ve received the best price. The question to ask to spot the lie: No question. Simply say “sorry, no,” then silently wait. Chances are, they’ll go ahead with the purchase. 5. “Your competition is cheaper.” If you’ve done your homework, you’re not selling a product of similar value at a more expensive price than your competitors. What the customer’s really saying is that they’re not able to distinguish the value of your product from that of cheaper competitors. The question to ask to spot the lie: “Are you sure you have the pain and the money to buy my product? It may not be for you.” Give the customer permission to say “no,” and you’re more likely to get a truthful reply. 7. “It’s a totally open RFP.” Many customers send a “Request for Proposal” to find the right vendor for their company. Small businesses need to be careful when dedicating resources to complete the RFP, because, behind the scenes, the customer may have already chosen a vendor and this process is just a formality. 8. “I’ll pay my bill on time.” Most customers actually mean this, but if they don’t pay upfront, a lot of them will pay late. According to Susan C. Keating, president and CEO of the National Foundation for Credit Counseling, one-third of all consumers don’t pay their bills on time. The question to ask to spot the lie: No question. Instead, get the payment before delivering the product or at the time of delivery. If you must give terms, pull the customer’s credit score. If it’s below 700, use that score to justify getting your payment upfront. 9. 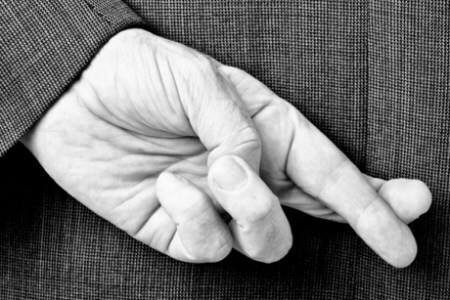 “I promise to pay on time next time.” Most customers develop a payment track record. If they paid late once, it’s more likely they’ll pay late again. The question to ask to spot the lie: No question. Instead, stop giving that customer credit terms. 10. “I need a refund.” Many times, the customer is telling you they’re dissatisfied. They don’t really want their money back—they want their problem fixed. They just really want the solution they purchased to work for them. The question to ask to spot the lie: “How can I still help fix your problem?” If you solve their problem, they’ll keep your product.